Building a large distributed system to disseminate and manage large-scale climate data and resources such as the Earth System Grid Federation (ESGF) is essential. Equally important is the Community Data Analysis Tools (CDAT) for analyzing, diagnosing, visualizing data for model-intercomparison projects’ observation output, and very high-resolution climate-model simulations. Developed by partnering with ESGF and the community to create a larger problem-solving environment, CDAT is an open source, easy-to-use application that links together disparate software subsystems and packages to form an integrated environment for analysis and visualization. This project seeks to advance climate science by fulfilling computational and diagnostic/visualization capabilities needed for DOE’s climate research. Led by Lawrence Livermore National Laboratory (LLNL), the consortium consists of four DOE laboratories (Los Alamos, Lawrence Berkeley, LLNL, and Oak Ridge), two universities (University of Utah and the Polytechnic Institute of New York University), NASA, and two private companies (Kitware and tech-X) that will develop reusable software and workflow analysis and visualization applications for large-scale DOE climate modeling and measurements archives. The CDAT concept is simple and flexible enough to interchange parts to expand for future DOE activities. CDAT can access the ESGF data collections and display results. 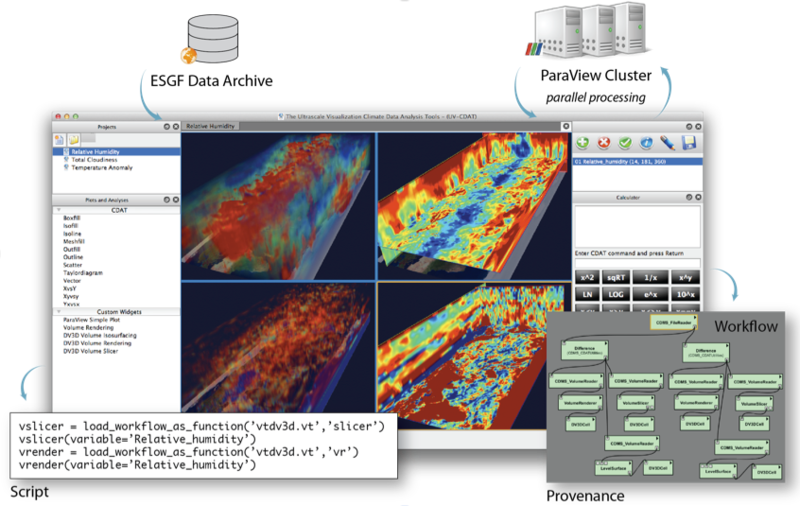 Parallel processing, data reduction and analysis take place via ParaView (in the future also by VisIt) and multiple views are displayed back to users. The workflow script captures the entire process for reproducibility and knowledge sharing.